The pack contains 4 Off-white Citronella Scented Pillar Candle. Citronella pillar candle is a natural mosquito repellant, which is why you all usually find citronella candles surrounding your friends at any outdoor event. No one wants mosquitos to crash the party. Consider getting multiple citronella candles and scattering them around the area, so you are protected from all angles. They burn for up to 36 hours, so you should be covered for the duration of an evening event. 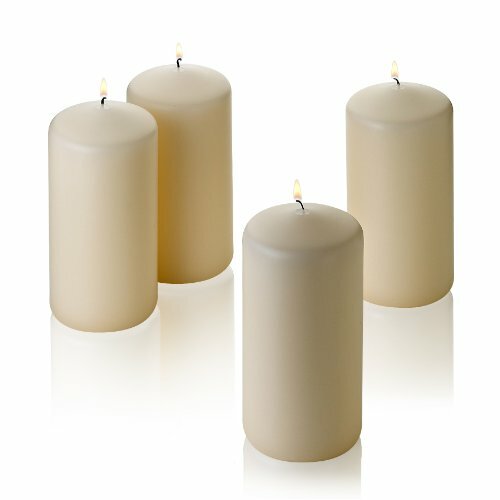 Our Citronella Pillar Candles are made from the highest quality wax and citronella oil. Effective protection from bugs and mosquitoes. Set of 4 Off-white Citronella Scented Pillar Candle 3 inch Tall X 3 inch Wide. Outdoor / indoor citronella candles. Burn 36 Hours. Perfect candle for your home, patio, camping or beach trip and much more!